Virginia State Police said three people were killed and eight others were injured after a tornado hit the farming town of Waverly, southeast Virginia. Nearly 123,000 were without power. Police officials have not released the names of the victims but said a 2-year old boy, 26 year-old man, and a 50-year old man were killed when their mobile home was destroyed in Waverly, according to WTVR. The bodies, found 300 yards from the mobile home, were transported to the Office of the Medical Examiner in Norfolk for positive identification. The strike in Virginia on Wednesday came from a severe storm that had pummeled the southern states over the last two days with 20 tornadoes reported, and is now sweeping up the East Coast. The National Weather Service issued a tornado warning for Virginia, and weather radars showed a twister did touch down in the state. The tiny farming town of Waverly, in the state’s peanut-growing region, took the brunt of the storm, #tornadogeddon, with winds as fast as 60 miles per hour. Five structures in town were damaged, according to officials, in a town of approximately 2,000. Emergency Management said they spotted the twister touch down along Route 460 before slamming into Waverly. "It was only 3 minutes, but it was fast and ripped things apart," one witness told WTVR of the twister. Leaving in its wake flipped cars, and snapped trees. In a separate incident, Timothy Williams told AP a friend had just come to take his new car for a drive when the storm hit. “It picked the car right off the ground, and put it right back on the ground,” said Williams. Along the road could be seen great clump of twisted metal. In Appomattox, the twister left evidence of pummeling a house, sheering off its side, and grinded a trail through the center of the roof, according to Storm Report. 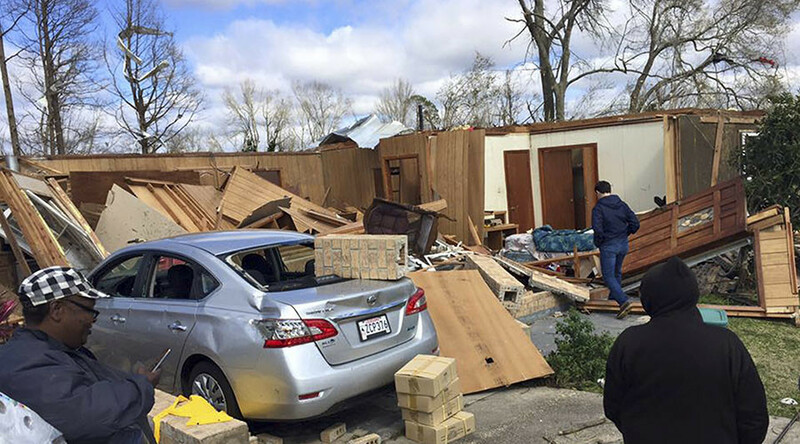 The storm system forecasters said has spawned 20 to 24 tornadoes in the two-day span that began along the Gulf Coast, damaging hundreds of homes in Louisiana, Mississippi and Florida. The storm has killed at least six people and injured several dozen others. A large tornado was reported on the ground near Henderson, North Carolina on Wednesday evening, as the storm moves to Washington, DC. Forecasters warned the threat was not over and that more than 88 million people were at risk of experiencing severe weather. Damaging storms, with heavy rains and strong winds, are moving up the East Coast. An 18-wheeler truck flipped over its side on the George Washington Bridge, which connects New Jersey and New York. Mayor de Blasio announced late Wednesday that a travel advisory would be in effect for New York City from Wednesday evening through early Thursday morning. A tornado watch is in effect in New Jersey as are flood warnings along the coast. The AP reported thousands in Virginia, Maryland and Washington DC lost power and motorists have been stranded by flooded roads. The Washington Post said more than 25,000 homes and businesses in the DC area lost power; more than half had regained power by 9:45 p.m. Roads in several areas, including an exit from Interstate 95 in Baltimore and Interstate 495 in Columbia, Maryland were closed because of high water. Fire officials in Maryland rescued a man after a basement wall collapsed on in a Silver Spring home. Virginia Governor Terry McAuliffe (D) declared a state of emergency and said he would visit areas damaged in the storm on Thursday. A tornado struck a small farming town, Waverly, earlier in the day and destroyed several buildings, and left three people dead, and injured 8 others. The storms dumped several inches of rain in Alabama, Georgia and elsewhere, causing flash flood watches. Further inland, a snowstorm has been pounding the Chicago area. Forecasters say northern Indiana could get up to 18 inches of snow. Nearly 1,200 flights into and out of Chicago airports were cancelled Wednesday night.